Forum Index > Historical Arms Talk > How about some Iberians? Albion does have in the works an early Germanic blade with a spurred hilt. It's not a falcata, but it does have some similar lines. A quick question (mainly to Spanish speakers here, but not only) : I suppose there have been metallographic studies of falcatas ; where could one find them ? ...there was once a small chain between the end of the grip and the spur of the guard....So, do you think that would have been decorative or functional, and if the latter, for what? Judging from the small diameter of the ring holding the end of the chain it is difficult to say if it was mostly decorative or if it acted as protection of the fingers. 16th C hungarian (and Polish?) sabres have a chain between pommel and cross to protect the fingers of the hand, but these chains are more substantial. There is one exapmple of an unusually large falcata (blade length 52 cm) in the Archaeological museum in Madrid (# 10475) that has the unusual feature of a solid rod between the spur of the guard and the beak of eagle head at the end of the pommel. This shows that they were interested in the extra protection that a chain (or rod) might afford to the fingers of the hand. I think the extra protection was only a secondary need, however. The primary function of of the almost encircling grip was probably making the grip more secure. Compare the curving end of the pommel of the falcata with the 13th C fauchards or falchions shown in the Maciejowski bible, and the chopping knives/short swords used in Italy up to at least 18th century called "storte contadine". They all share this same feature: a spur that curves around the back of the hand. I was wondering if you could answer a question for me- I have read that the Romans were mightlly afraid of the Falcata due to it's apparent reputation for cleaving Roman helmets, and that the reinforcing bar(s) along the forehead of later Roman helms was added to help prevent the Falcata from splitting them in half. Is this true? I know that there are lots of guys who don't think a sword can EVER split a helm but I'm not one of them. There is a nice article by him about falcata at the Gladius Revista's website. For what I have read of it (cursory reading) it is mainly a typological and etymological study. Sweet! That's one more seriously underrepresented swords in reproductions off the list. It's looking great too! There are people here that could answer this question much better than me... but let me tell you what I remember. I believe that it was the Dacian Falx that led to the Roman Ridge Helms. 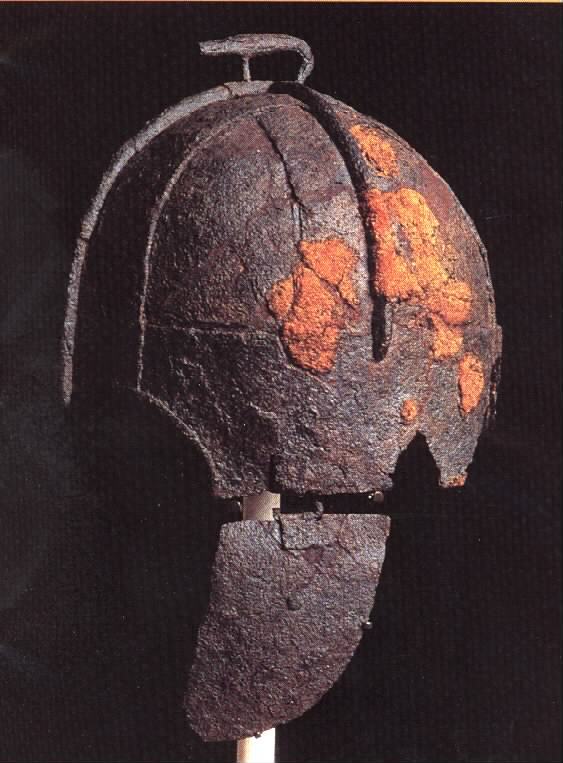 The were called "ridge" helms because the had reinforced metal ridges on the crest and possible cross bar, across the top from ear to ear. These ridges are bars would slow down the falx befor it cut into the helm. The falx was a thick sycle like blade on the end of a long pole. The long pole allowed for alot of angular momentum to build up before it crashed into the helmet. I believe that most Falcata blades are to thin to cut into a helm, the edge would probably roll. You might want to take a look at this thread. It has some cross sections. Thanks for the reply. Dacians, huh? I can believe that. They gave the Romans quite a bit of trouble until finally put down by um, Trajan? But the Roman helms also had a bar(s) that ran horizontally across the forehead (I assume for the same sort of reason). Was that because of the Dacians as well? Unless I just misunderstand what you are referring to. Not over the forehead but transverse over the top of the helm. I guess this was to protect from a blow from all directions. Here are some pics of helms with the other bar, although I think it was more rare.